Do you remember being a child and dreading being chosen for washing up duties? Or as an adult do you eat out so that you don’t get lumped with horrendous amounts of dirty dishes? Today, in America more than 75% of households own a dishwasher to take the hassle out of dining at home. Whether you own your home and do not currently have additional funds, your kitchen is already a tight squeeze or you are renting, the good news is that you can easily install a counter-top dishwasher to clean your cups, plates and utensils. Countertop dishwashers are a modern, hassle free and portable way to wash up. Countertop dishwashers, commonly referred to as portable dishwashers are an electrical appliance that take the hard work out of cleaning up after meals. 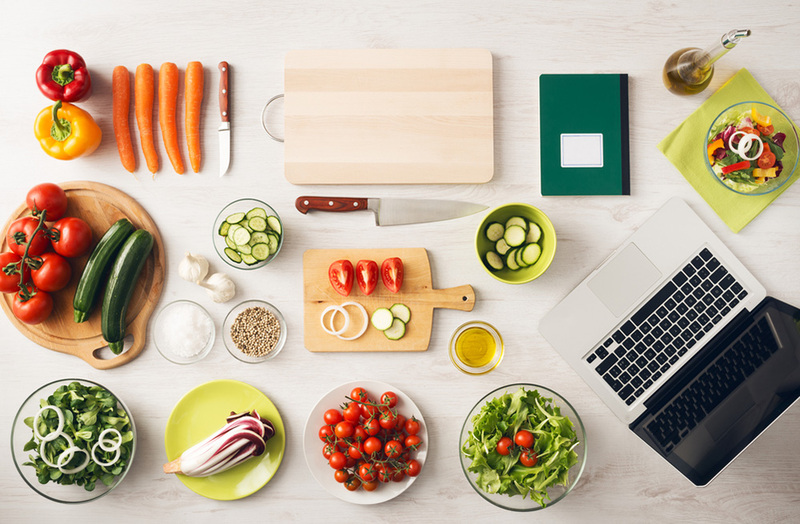 Countertop dishwashers are very similar to standard dishwashers in the way that you can stack dirty plates, cups and utensils and have them cleaned with the click of a couple of buttons. Countertop dishwashers differ in the way they can be disconnected, lifted and transported with ease. Countertop dishwashers gained their name from the way they are portable and can be placed on a flat kitchen counter. These washers simply connect to the kitchen tap rather than needing to be fixed into piping. This makes them suitable for home owners that do not have the money to purchase a built-in dishwasher, those that do not have access to additional piping in the kitchen area and those who are only renting. Furthermore, these dishwashers can be stored out of sight from mischievous children and guests. Like the countertop dishwasher, the portable dishwasher also can be transported with ease. The difference between these two similar appliances is that the portable dishwasher has wheels and stands on the floor opposed to the counter. If you find that counter space is limited, perhaps you live in an apartment, a portable dishwasher may be a better solution for you. How Do Countertop Dishwashers Work? 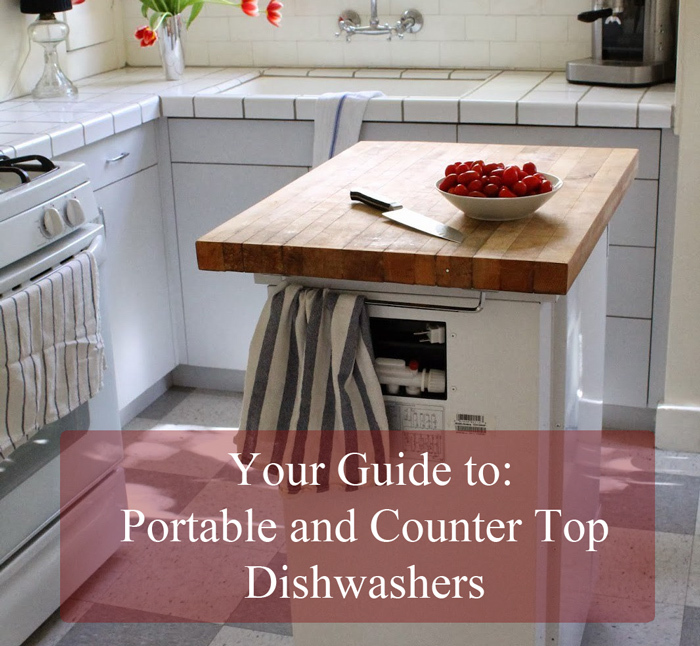 So we’ve established that countertop washers differ to traditional built-in dishwashers in the way that they can be transported but how do they work? A portable dishwasher generally comes equip with a connector adapter that can be attached to a sink faucet. The dirty water then drains out of a tube that you can lead back into your kitchen sink. They are an electrical appliance which means they will need to be plugged into an electricity source while washing. Are you considering purchasing a dishwasher to cut down the clean up time after meals? Read below why a portable dishwasher may be the best investment for you. If you are currently renting your home or you do not have access to kitchen piping needed to install a built-in dishwasher, a countertop dishwasher is the next best solution to clean up dishes and kitchen utensils. If you have purchased a heritage home built many decades ago you may also notice that there is no room to fit a built-in dishwasher. These homes are perfect examples of where a portable dishwasher is the most cost effective solution. Older style homes often come with smaller kitchens then the kitchens built in new homes. This also means that cupboard space is crucial and putting a permanent fixture in is not ideal. Portable dishwashers can be left sitting on the counter if you find you use the appliance daily, although storing it in the garage is also an option if additional counter space is needed. The larger floor model portable dishwashers are generally equip with wheels which allows them to be easily wheeled away if you are expecting guests. If you have a small family where 4 to 6 place settings each night is all you find yourself washing up after dinner, a portable dishwasher is suitable. In fact, counter-top dishwashers are said to be more effective in cleaning a couple of place settings apposed to built-in dishwashers that are only less than half full. Using a counter top dishwasher ultimately replaces any need to wash by hand. While no appliance comes cheap, countertop dishwashers are far less expensive then their cousins, the built-in dishwasher. Many of the countertop or portable dishwashers can be purchased from anywhere between $200.00 to $300.00 USD. This is a small price to pay for the time you will find yourself saving each day. While the advantages of owning a countertop dishwasher definitely out-way the negatives, there are a couple of inconveniences that you may notice if you have a countertop dishwasher installed. A countertop dishwasher will need to remain plugged into the kitchen tap throughout the entirety of the washing cycle. This means that the kitchen tap cannot be used while the countertop dishwasher is being used. While the noise produced by the countertop dishwashers will vary from one make to another, the majority of portable dishwashers make greater noises than those that are built-in. The noise produced by these appliances is a small price to pay for time efficiency and clean dishes. 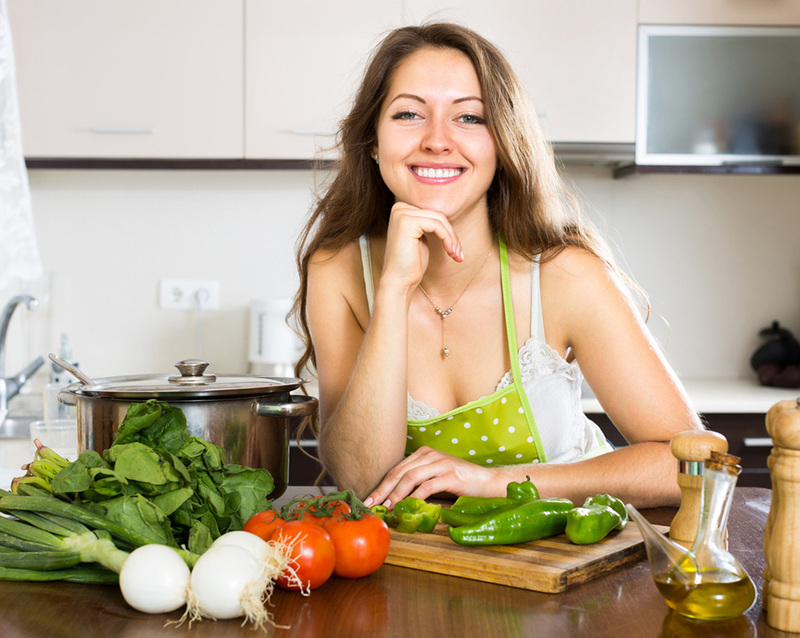 Many complain about the weight of countertop dishwashers meaning that some women and men may not be able to lift them with ease. If you intend on purchasing a countertop dishwasher, perhaps have a family friend (with muscles) place it on your countertop for you. While countertop dishwashers are most commonly used as either the primary or secondary washing appliance in a home environment, these dishwashers are also common in work places. For instance, an office may have one where staff are able to stack their coffee cups to be washed daily. 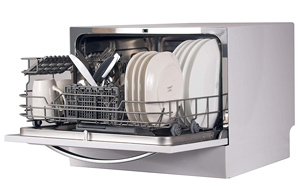 Other locations these dishwashers are useful is in caravans or RV’s and student accommodation where space is tight. From new mothers who use these appliances to take the stress out of washing numerous bottles a day, to time poor college students using a countertop washer to clean up their television dinners, portable dishwashers are used by numerous people in a number of different settings. You’re almost sold on a countertop dishwasher although before you go on to select your fancy new appliance, make sure you take a look at the couple of considerations below. Ensure the size of the dishwasher will fit on the kitchen counter. Furthermore, take note of the height of your proposed washer if you have wall cabinets that sit above your kitchen bench. While the size of the appliance is important, the size of the output hose is also important. Ensure the output hose will reach your kitchen sink to dispose of water waste. While saving a dollar or two when purchasing an item may sound wonderful at the time, you should confirm that it still meet your needs. Ensure that you take a look at what cycles can be achieved with the countertop dishwasher prior to purchasing it. If dry cycles are a ‘must’ for you, ensure the countertop dishwasher you are considering to purchase comes with this nifty feature. The material the counter-top dishwasher is made of will ultimately determine how long it will last. A stainless steel counter-top dishwasher is bound to outlive the plastic portable washers. 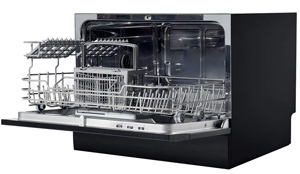 The washing capacity should also be considered when selecting a countertop dishwasher. Generally these portable appliances will be able to wash between 4 – 6 place settings at any given time. Some of the larger portable washers may allow for more. While the brand of an item should not determine if it will be quality or not, when speaking about appliances, some big brand names often carry a better reputation than others. Choosing a big brand countertop dishwasher can also provide you with peace of mind if they offer a warranty or money back guarantee. If this is your first time purchasing a dishwasher, ensure you select one with some kind of guarantee. The Sunbeam Compact Countertop Dishwasher is a great investment for those wishing to wash up to 6 place settings at any given time. This dishwasher has 6 different washing cycles to choose from, one being an eco wash. The Sunbeam countertop washer boasts it’s easy installation process, stainless steel interior and timer setting. This dishwasher is great if you like to wash at the end of the night, or while you are not home. The timer allows for a 2, 4 or 8 hour delay which is perfect if you work a lot. 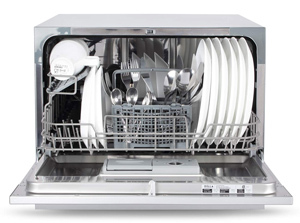 The compact Sunbeam dishwasher can be purchased in a number of colors including silver (pictured), red and white. This dishwasher can be found on Amazon for around the $270.00 USD mark. 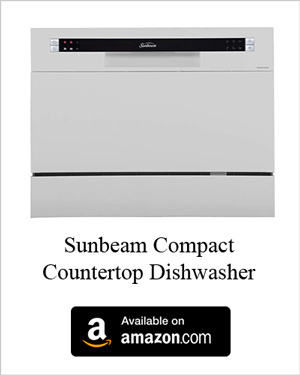 What Have Others Said About the Sunbeam Countertop Dishwasher? Black + Decker’s take of the countertop dishwasher is sleek and modern. Accommodating for up to 10 dinner plates at once, the 7 washing programs can be set from the LED touch screen controls. This washer comes with the nifty child lock feature which is perfect to keep young children safe. The Black + Decker portable dishwasher shows that washing can be sleek and subtle. 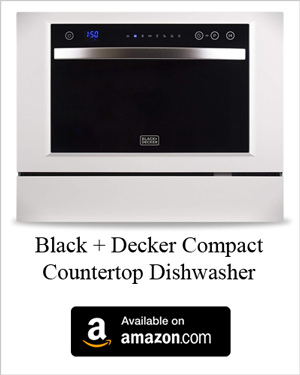 The Black + Decker Compact Dishwasher can be purchased for approximately $300.00 USD using the Amazon buy button above. What Have Others Said About the Black + Decker Countertop Dishwasher? 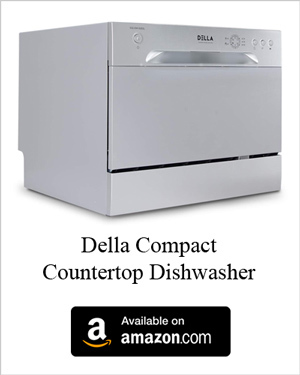 The Della Compact Countertop Dishwasher is a great and compact appliance that takes the stress out of washing up. This appliance has 6 different wash cycles to choose from which can then be delayed by 2, 4 or 8 hours if you’d like your dishes to be cleaned while you are out. Available in black, silver and white, this dishwasher generally retails for $260.00 USD on Amazon. This is in fact a small price to pay for a stainless steel portable dishwasher. What Have Others Said About the Della Countertop Dishwasher? 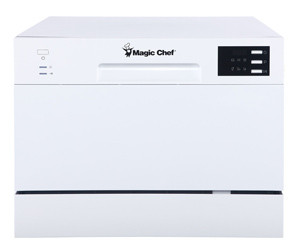 The Magic Chef Compact Countertop Dishwasher is among the cheapest of its kind. While this dishwasher is made of plastic, meaning that it will not last as long as those made of stainless steel, it does boast some great features. The Magic Chef Dishwasher can hold up to 6 place settings and offers 5 different wash cycles which can easily be programmed. 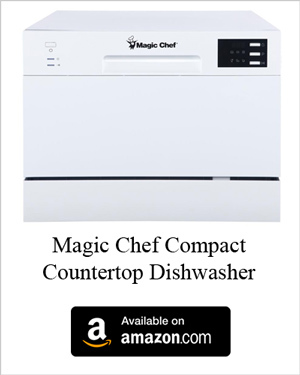 This appliance by Magic Chef is very cost efficient at only $215.00 USD on Amazon. What Have Others Said About the Magic Chef Countertop Dishwasher? Similar to the Black + Decker Countertop Dishwasher, the Ivation Dishwasher comes in a sleek and subtle design. Available in either black or white, the Ivation is made of stainless still for durability. Offering 6 different washing cycles to choose from and fitting 6 place settings, the Ivation Countertop Dishwasher is hard to pass by. This appliance comes equip with a sliding dish rack, cup shelf and silverware basket. 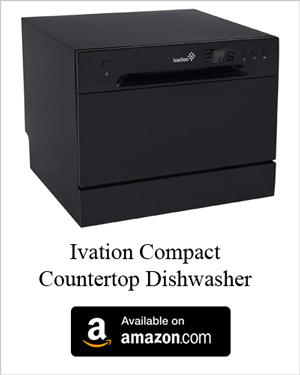 On Amazon, this countertop dishwasher can be purchased for approximately $250.00 USD. 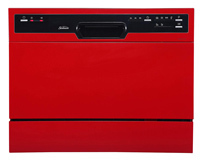 What Have Others Said About the Ivation Countertop Dishwasher?